One aspect of playing I have written little about is touch and articulation, specifically staccato. This past semester, several of my students have taken advanced graded ABRSM exams, requiring many scales, the majority of which must be played legato (smoothly) and staccato (short or detached, indicated on the score by dotes above or below notes as in the example above). Most pupils have few problems negotiating rapid legato scales, but short detached passage work at speed rarely feels comfortable, hence staccato scales are sometimes taken much slower than the intended tempo. Scales are only one facet of acquiring an effective staccato technique, but they do provide a convenient vehicle for those just getting to grips with short, crisp articulation, and with this in mind I aim to offer a few tips, which may (or may not!) be helpful. As with so many areas of piano playing, tension can rear its ugly head and ruin even the best intentions. Economy of movement is essential as is ‘built in’ flexibility. There are many different types of staccato; ‘close to the keys’ staccato, ‘finger’ staccato, wrist staccato, whole arm staccato, and a few others in between. Each variant will need a different technical approach. This applies to both the physical and mental set-up. However, in this post, I will deal with finger staccato, and how to achieve crisp, clear and even note groups, helping those who are working at their scales, exercises, or simply wanting to produce neater articulation. 1. 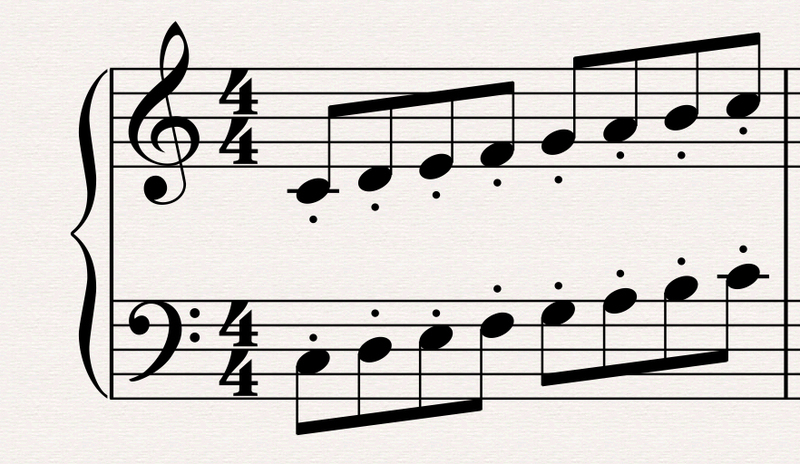 Finger staccato implies that only the fingers should move. This is true, however, if the arms and wrists remain completely static, tension will quickly arise, rendering fast movement virtually impossible. Start by ensuring complete freedom in the upper body. Drop your arms by your side freely, whilst sitting at the piano, and notice the relaxed, ‘heavy’ feeling. If you can replicate this feeling when playing, flexibility won’t be an issue. As with many technical challenges, focus on how your body feels when playing, not just on what is being played. 2. Practice rapid finger movement away from the piano. Fingers should work from the knuckles, without the aid of the hand or wrist, and every joint must be complicit; they need to move independently, using the first two joints of each finger particularly. Aim for a very swift finger motion; encourage fingers to assume a tapping movement. This can be built up, so work in short sharp bursts for a few minutes at a time, returning to dropping arms by your side at the end of each brief session. 3. As with most techniques, starting slowly often produces the best results. It can be useful to use heavy finger strokes to begin with; playing much heavier, forcefully and with strong fingers in order to strengthen them and become accustomed to the quick, snappy movements. It’s important to pay attention to how every note ends. Think spikey, pithy, sharp, and extremely short. Combine this with a free wrist at all times; letting go of tension at designated places. 4. Once heavy movements have been assimilated and they feel comfortable, lighten your touch, using the finger tip (or top of the finger), and aim to acquire a ‘scratch’ or flicking motion, so every note can remain incredibly short and effectively sounded. Once the finger has ‘flicked’ it will usually draw inwards, almost into the palm of the hand, but best not to allow it to go too far, as quick finger changes necessitate fingers to resume the usual position promptly. When playing a whole scale or passage using finger staccato, it can be beneficial for the hand to employ a very slight ‘bouncing’ motion, allowing flexibility, but keeping the flow. 5. Practice passage work in different rhythmical groups; groups of four semi-quavers can be accented slightly on every first beat of the group, to improve co-ordination (if hands are playing together). Practice different strong beats, so all fingers can attain control, making it possible to achieve totally even playing, both rhythmically and tonally. Every time the thumb turns under (or the hand turns over it) in a passage, encourage the wrist to use a small rotational or circular movement, providing a place to release any tension caused by the incessant ‘picking up’ finger motion necessary for finger staccato. Even using a ‘scratch’ or flicking technique, fingers still need a ‘picking up’ movement, which after a while, becomes tiring. If tension does build, stop immediately, and only practice a few notes at a time. Divide passages into small sections to begin with, building up as and when strength is acquired. The deeper and heavier fingers are worked whilst practising slowly, the less the eventual effort when playing fast, light and crucially, detached. This can work for many other types of technical issues too. Try incorporating some of the above, and hopefully your finger staccato will sound lively, energetic, and clear! Excellent practical advice. Staccato playing with crisp and uniform volume and then going up n down in volume/sound level is always challenge. The steps provided are a great help to perfect the technique.